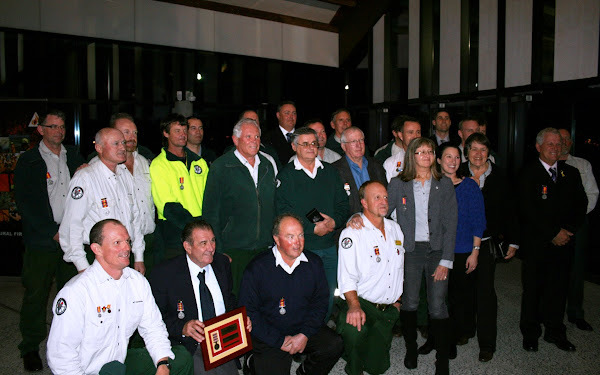 The careers of thirty five fire fighters were recognised last night in a ceremony held at the Arboretum in Canberra. “I’m incredibly proud of the staff in our teams for their dedication to the ACT Rural Fire Service,” Neil Cooper, Manager Fire, Forests and Roads for ACT Parks and Conservation Service said today. “Each of the medal recipients has put themself at risk to protect the people, properties and environment in the ACT, which is an important commitment to recognise. “Of the 35 recipients, 22 have served between 10-20 years, nine served between 20-30 years, two served between 30-40 years and another two served between 40-50 years. This amounts to just over 700 years of combined dedicated fire service to the ACT community and its environment. As soon as we know the names of these fire fighters we’ll include them in the story. Let us not forget the other 135 volunteer firefighters who were also recognised for their service.